These two images of the Tuamotu Archipelago, French Polynesia, illustrate diversity in the morphology of atolls, one of the major types of coral reef formations. A typical atoll structure is a lagoon surrounded by a closed rim of cays and shallow spillways that control the exchange of water between the ocean and the lagoon. However, like human beings, this general scheme may vary according to the history of each individual atoll, resulting in a high diversity of morphology, especially for small atolls. The two neighboring atolls shown here have some unique features. What was a lagoon on Nukutavake (138°48' W 19°17' S, 6.2 km2) is now dry and completely covered by vegetation. Pinaki (3.54 km2) has a drying shallow lagoon still connected to the ocean via a single narrow spillway. The variation of morphology implies that each atoll may have a different equilibrium between ocean, lagoon, and land ecosystems. Images such as these are useful to classify and study the atolls according to their spatial structure. Caption provided by Serge Andréfouët, Remote Sensing/Biological Oceanography, University of South Florida. Images ISS002-ESC-5677 and ISS002-ESC-5401 were provided by the Earth Sciences and Image Analysis Laboratory at Johnson Space Center. Additional images taken by astronauts and cosmonauts can be viewed at the NASA-JSC Gateway to Astronaut Photography of Earth. These two images of the Tuamotu Archipelago, French Polynesia, illustrate diversity in the morphology of atolls, one of the major types of coral reef formations. A typical atoll structure is a lagoon surrounded by a closed rim of cays and shallow spillways that control the exchange of water between the ocean and the lagoon. However, like human beings, this general scheme may vary according to the history of each individual atoll, resulting in a high diversity of morphology, especially for small atolls. 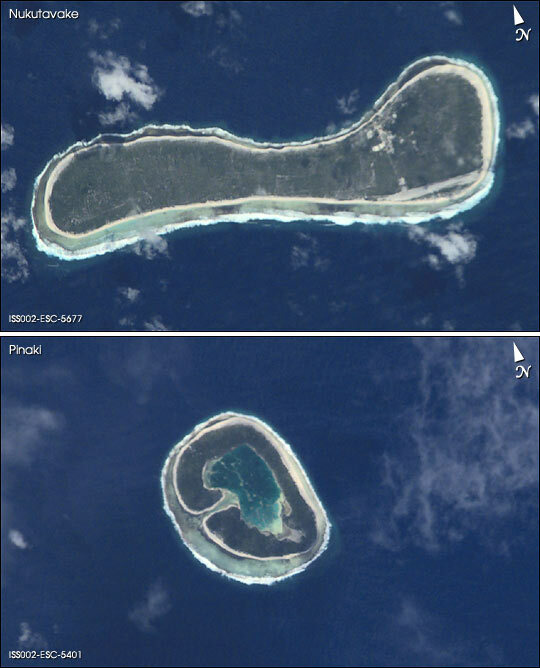 The two neighboring atolls shown here have some unique features. What was a lagoon on Nukutavake (19°17′ S 138°48′ W, 6.2 km²) is now dry and completely covered by vegetation. Pinaki (3.54 km²) has a drying shallow lagoon still connected to the ocean via a single narrow spillway. The variation of morphology implies that each atoll may have a different equilibrium between ocean, lagoon, and land ecosystems.